Against all odds, Katniss has won the Hunger Games. She and fellow District 12 tribute Peeta Mellark are miraculously still alive. Katniss should be relieved, happy even. After all, she has returned to her family and longtime friend, Gale. Yet nothing is the way Katniss wishes it to be. Gale holds her at an icy distance. Peeta has turned his back on her completely. And there are whispers of a rebellion against the Capitol-- a rebellion that Katniss and Peeta may have helped create. 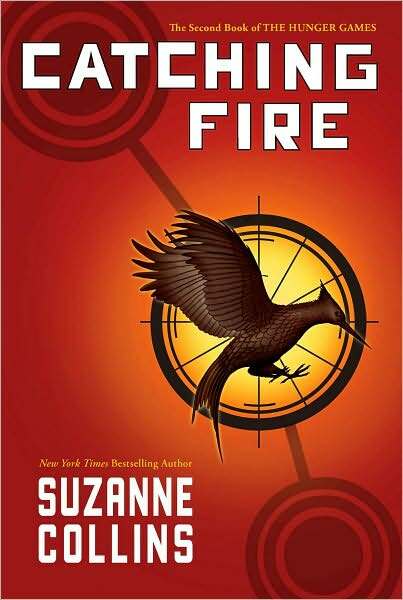 Just an hour ago I finished the sequel to the Hunger Games series.Catching fire was really good though I enjoyed the first book better. I liked how we were able to see Peeta more and because of it he has become such a deep character. Katniss is the same as always, awesome, though I don't like how she can sometimes be so oblivious to what's going on around her. I really liked meeting new characters like the other HG champions that really added color to this story. However Gale has seemed really two dimensional to me, we never really get to know the real him and both of the previous books have only dedicated a couple of chapters to him. What I'm super worried about is if Katniss ends up going with Gale in the next book after everything she and Peeta have gone through and how Suzanne Collins has made us fall in love with him. I really liked the adventures of the arena and how detailed it all was so that we were able to visualize it all in our mind. The ending was a bit rushed in my opinion and it all kind of went by in a blur of a few pages.The book ended with a cliff hanger of all cliffhangers and I'm really excited about reading the next book. However, I'm kind of sentimental when it comes to the end of book series so I like to stretch the last book out as long as I can, though if it's good I may end up finishing it in a day. I won't be reading MockingJay next just so that I can anticipate the adventure a little bit longer. I'm glad you liked this one too Noellie. Catching Fire is actually my favourite book of the HG series. Looking forward to know what you think of the third and final book :) !! Thank you so much for stopping by my blog and leaving such nice comments :) !! I'm so excited for the last book, a lot of people have said that it's got a lot of action and swoon worthy moments XD. Yay! XD Thank you so much :) oh and not at all, I should've had that up there to begin with.